Hello hello! I hope all of you had a deliciously lazy, rainy weekend like I did. It was nice to catch up on some much needed sleep! 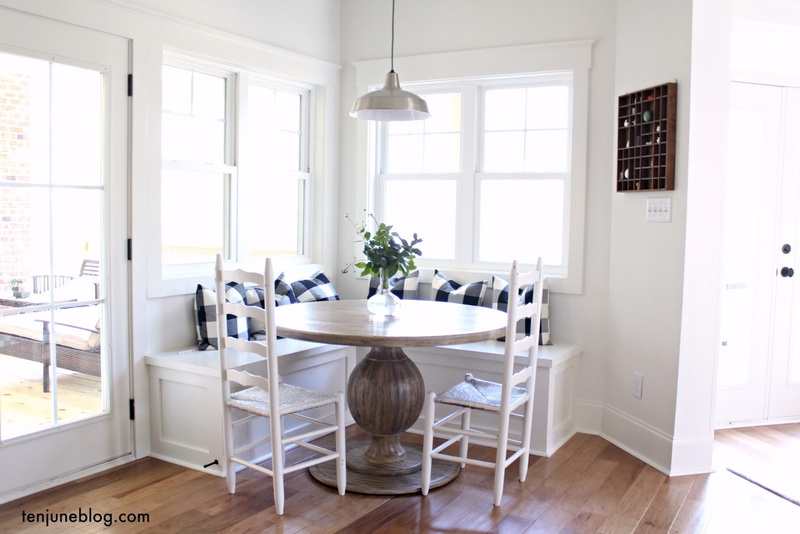 David and I also tackled a few things around the house to prep us for selling our house. We're still not officially listed, but hoping to make that happen within the week. 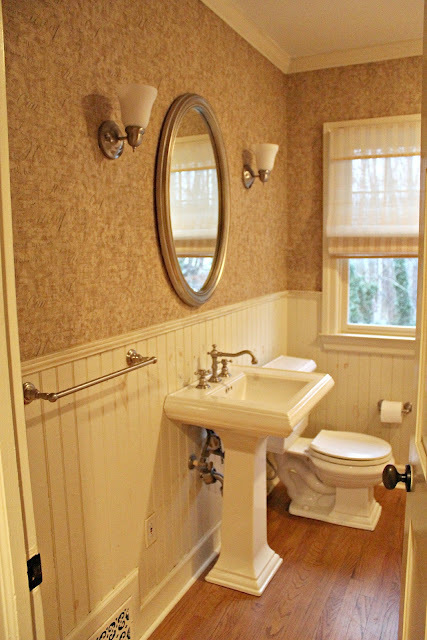 As you know, we decided to do a mini-makeover of our guest bathroom. With it's purple ceiling and somewhat medieval fixtures, it was definitely an intense room. Not so buyer-friendly, needless to say. But with the help of a roller and some fabulous paint + primer in one, we were able to repaint the ceiling last week. Wowzers. What a difference just that made! This weekend, David and I added some new shiny fixtures. 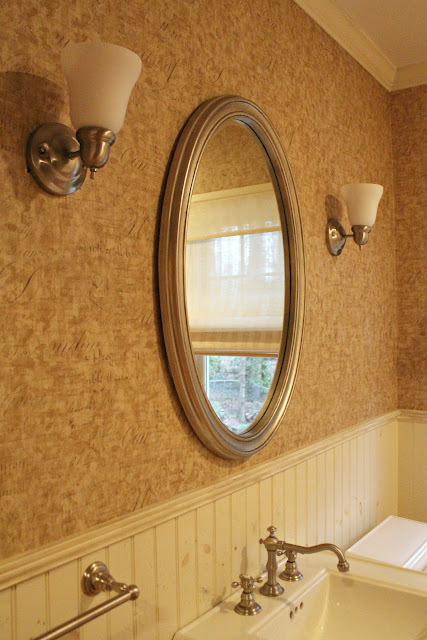 We replaced the antique mirror and sconces (which are both now on Craigslist- email me if you're local and interested!) 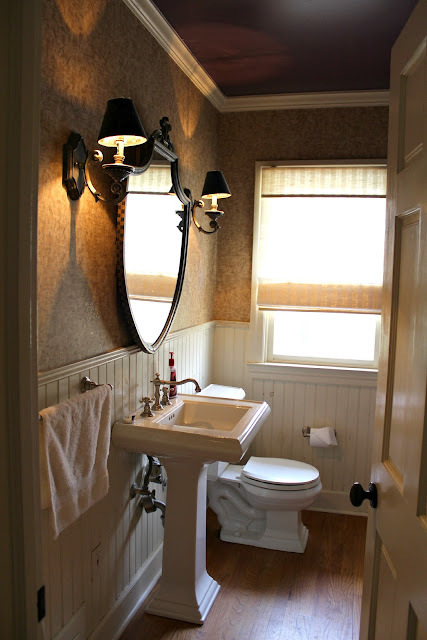 with a polished nickel mirror and sconces that match the beautiful fixtures already in the room, like the adorable faucet on my beloved pedestal sink. Check it out! And a couple of shots without the sconces on. Looking good, right? Especially when you compare it to what we started with. We've come so far! For those who are wondering, the mirror is from HomeGoods ($40 - $20 gift card I had) and the sconces are from Home Depot ($15 each). Yeah, we roll on $50 makeovers around here. Don't forget, we've got a couple more things to cross off the to-do list! 1. Paint the purple ceiling. 2. 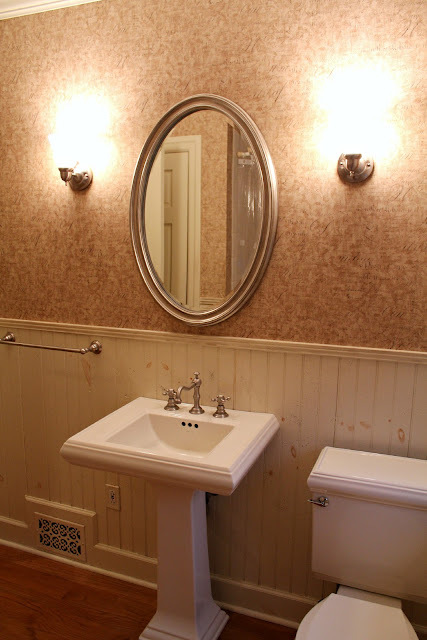 Switch out the antique mirror. 4. Replace the shower curtain. 5. Add some accessories to the space. What a huge help! 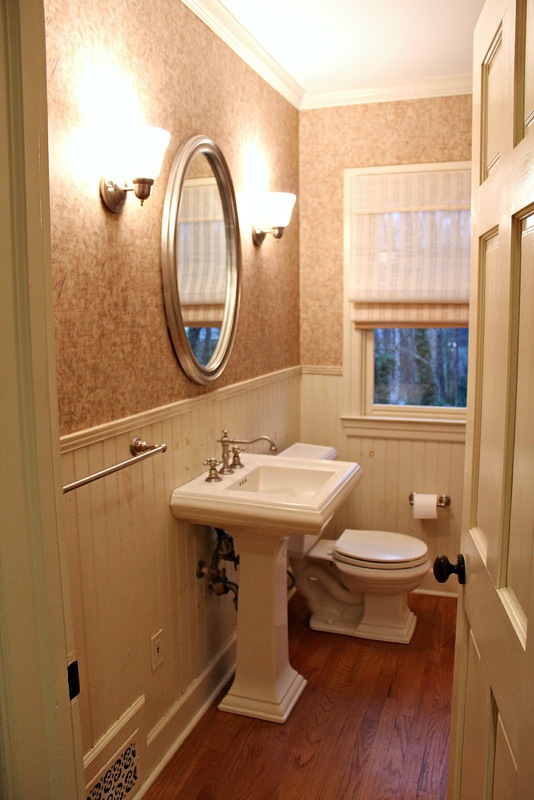 Updating fixtures can drastically change the look of a room. Great job! I've said it before, and I'll say it again. I want to buy your house. The thought of a guest bathroom is enough to make me squeal! I loved the purple but you're right...some buyers just aren't as cool. Oh this looks so much lighter and open! Love it! I love it! You're so right-- you complete a makeover and wonder "why didn't I do this earlier?" This looks really pretty - it is amazing how something so little can make such a difference - thanks for sharing! It's funny how much of a difference little things make! Looking good! It looks awesome, Michelle! Praying for y'all in the selling and moving process! Looks great! And I cant believe you only spent $50! Looking good!! Must feel good to make some progress on your list-- kudos! I'm going to go against the majority and say i loved the before better. Though, I totally understand the update and agree with you completely for doing it. I'm just saying, the before made me swoon... and still does! Good luck with the sale! I'm sure this change will help. So inspiring, it looks great!